Maduro went on to claim that hundreds of “mercenaries” are preparing an invasion of Venezuela in neighboring Colombia under Bolton’s command. “In the north of Santander [Colombia] they are training a G8 group, there are 734 mercenaries, both Colombian and Venezuelan … they seek to create false positives that simulate attacks by alleged Venezuelan government officials on the border,” he claims. Those attacks would then allegedly be used as justification for a coalition of U.S. and Latin American troops to invade Venezuela. 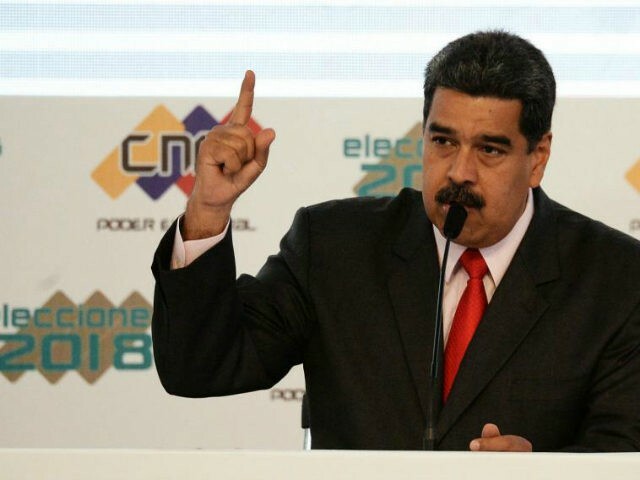 Maduro also accused Brazil’s President-elect Jair Bolsonaro of playing a role in galvanizing regional powers against the socialist regime in Venezuela. “Brazil’s forces want peace. Nobody in Brazil wants the future government of Jair Bolsonaro to get involved in a military adventure against the people of Venezuela,” Maduro claimed. Bolsonaro, a staunch anti-communist, has said that, as South America’s largest country, Brazil has an “obligation” to lead the region out of over a decade of socialist rule that has decimated its economy and fueled violence and poverty. The Bolsonaro campaign used Venezuela as an example regularly of what another term of socialist rule, which Brazil endured for most of the 21st century, would do to the country. Venezuela is currently experiencing the worst humanitarian crisis in its history; most Venezuelans struggle to eat three meals a day, the nation lacks nearly all medications the World Health Organization (WHO) deems necessary for running a functional healthcare system, and Maduro’s cronies have succeeded in stifling the nation’s oil industry despite possessing one of the world’s largest oil reserves. The Maduro regime repeatedly rejects humanitarian aid from neighboring countries. Maduro claimed to have survived an assassination attempt in August after an explosion interrupted a military rally. Venezuelan socialist authorities claimed the explosion was a drone attack meant to target the dictator. Venezuela’s regime faced global mockery after video footage surfaced of the soldiers at the rally fleeing rapidly from the explosion rather than attempting to protect their leader. Maduro regularly claims that American officials are trying to kill him. As recently as October, Maduro alleged that Trump’s administration had “given the order from the White House that Maduro be killed” and outsourced the job to Colombia. The dictator made similar remarks during the Obama administration, at the time attributing the assassination plot to then-Vice President Joe Biden. Under President Trump, however, the Venezuelan regime has taken with particular zeal to attacking Bolton. Venezuelan Defense Minister Vladimir Padrino López delivered a speech in November dismissing Bolton as a “clown” for highlighting the relationship between Maduro’s regime and Marxist terrorist groups in Colombia. Bolton has also served as one of the most consistent voices against Latin America’s socialist and communist regime, first and foremost Venezuela, for the Trump administration. In a speech last month that triggered Padrino’s response, Bolton referred to Maduro, Nicaraguan dictator Daniel Ortega, and Cuban second-in-command Miguel Díaz-Canel as “the three stooges of socialism” and vowed increased sanctions and international pressure on their regime. Conversely, Bolton has extended a hand to conservative political leaders in the region on behalf of the White House. He visited Brazil in November to meet personally with Bolsonaro and discuss cooperation on topics of mutual import, including the Venezuelan migrant crisis. Brazil is currently taking thousands of Venezuelans in a day, seeking food and shelter but putting a strain on the nation’s weaker economies near the Venezuelan border. The border lies in the Amazon region, traditionally home to criminal gang activity and poverty, which has resulted in locals violently attacking refugees and destroying their property.